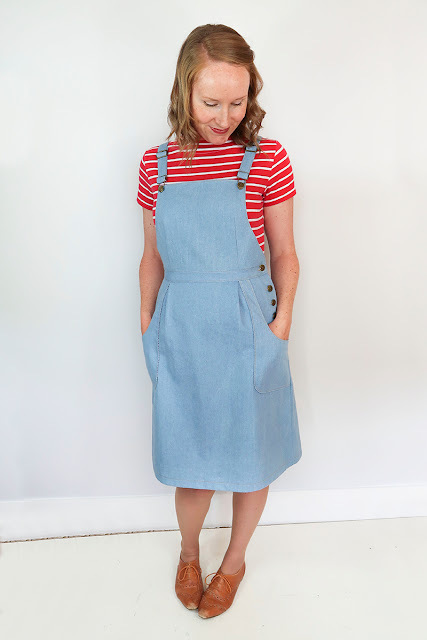 With a fitted bib, deep patch pockets and fun side button fastening, Pippi is a fresh take on the classic overall dress, combining comfort with a sleek and playful silhouette. 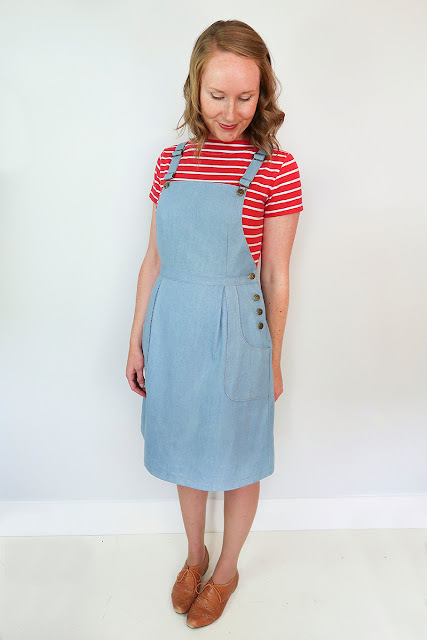 The Pippi Pinafore will become your favourite go-to weekend dress. Darts and gently curved sides shape the bib, creating a flattering silhouette for multiple bust sizes. The pleated front skirt and side button placket create a relaxed look while also stepping your sewing repertoire up a few notches. Straps cross over the back and fasten to the bib using your choice of overall hardware or buttons (depending on what you have in your stash). And deep, curved patch pockets make sure you have room for everything you might need throughout the day. Casual meets practical with a relaxed fit around the waist and hips, and when paired with a fitted knit Gable or Ostara top, or your favourite shirt, you'll be ready for a weekend away in the woods or for your favourite weekend brunch spot. 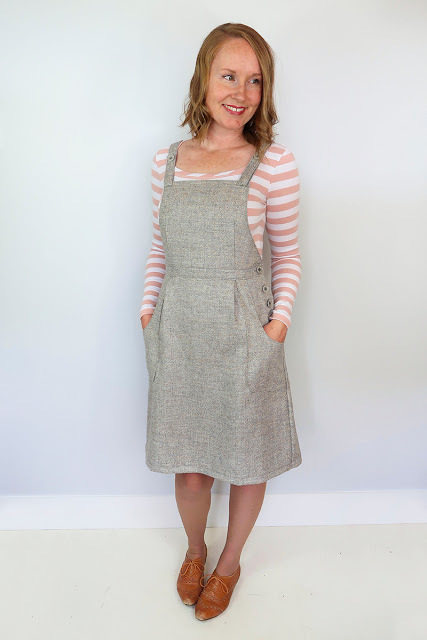 Pippi is perfect for those who like the bib-style pinafore dress, but want more shaping around the bust for a flattering fit. With cup sizes A to D included, you'll no longer need to make additional bust adjustments for the perfect fit. Pair Pippi with a short sleeved Gable Top for a cool, handmade summer outfit. 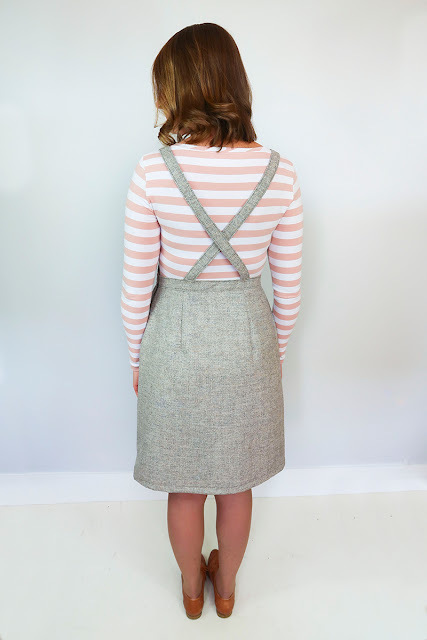 If winter is coming your way, making your Pippi Pinafore in wool and pairing it with a long sleeved Ostara Top, will keep you cosy and warm over the colder months. 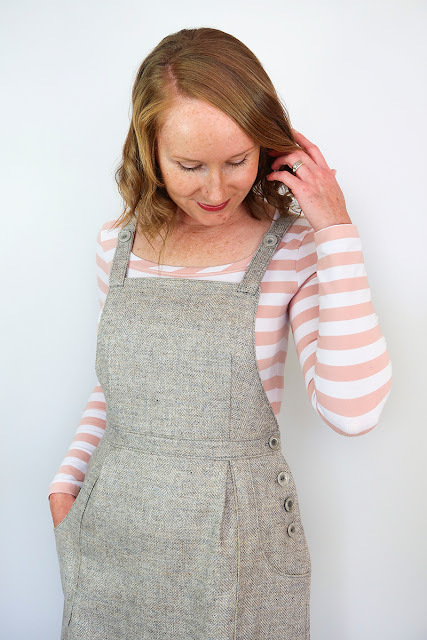 Pippi is a perfect project for the adventurous beginner seamstress and beyond. Learn techniques like top-stitching, constructing a side button fastening and attaching patch pockets. Pippi has you covered year round - made up in chambray or linen and paired with your favourite t-shirt, you'll be summer ready. And when winter temperatures hit, choose wool, corduroy or denim for the perfect dress layered over tights and boots. 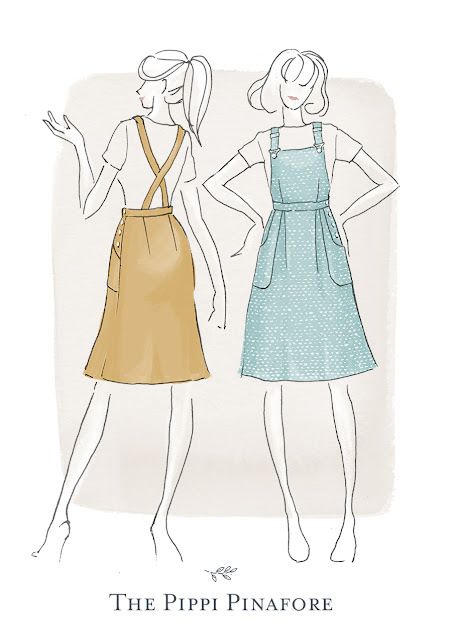 Fabric with structure and some drape work best, but stiffer fabrics will lend a more defined quality to your Pippi Pinafore. 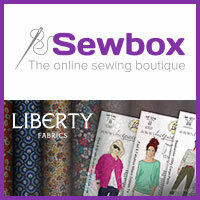 The bib, waistband and button band are all lined pieces - it's important to choose a light-weight lining to help keep bulky seams to a minimum (especially if you have heavier weight fabric in mind). Cotton lawn, voile and poplin make great options, as do quilting cottons when using a lighter weight fabric for your main garment. Both Print-at-Home and Print Shop Pippi pattern files now include the Layers Function. You can choose to turn on and off any number and combination of pattern sizes to suit your personal needs and preferences. Check out page 3 of your Pippi instructions for a full step-by-step tutorial on using this handy little function. 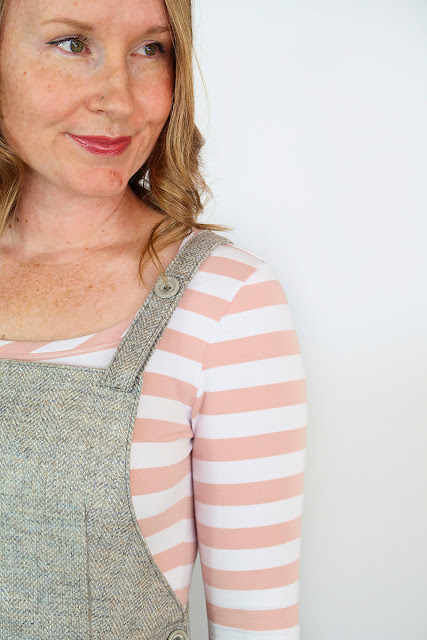 You can now purchase the Pippi Pinafore pattern for $12.99USD. 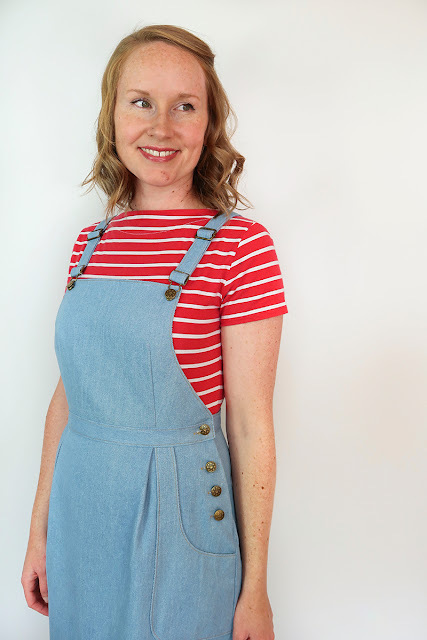 Links to your Pippi Pinafore will be emailed directly to you. You'll be able to choose from the easy-to-assemble A4/Letter version OR the A0/Print Shop version (or both!). 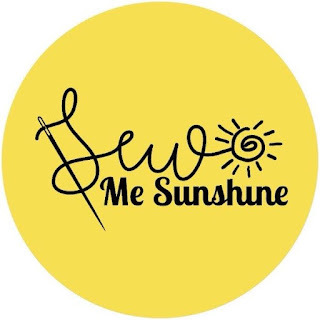 I'd love to hear how you're getting along making your Pippi Pinafore, so why not tag me on instagram or use the hashtag #PippiPinafore so I can see and share your makes! 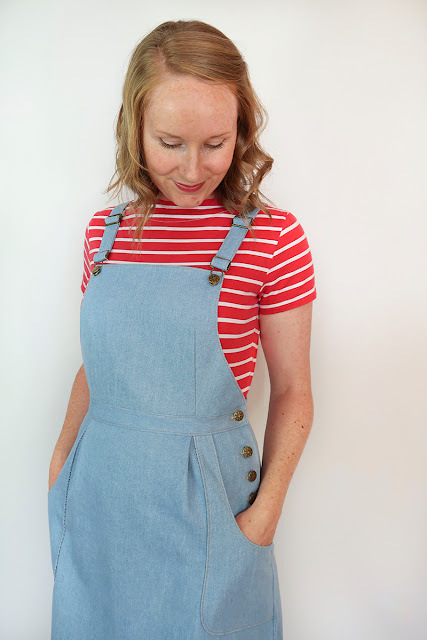 I've been caught up in last minute Pippi Pinafore preparations (the early bird newsletter went out this morning! Wow, I'm over whelmed by the support!) 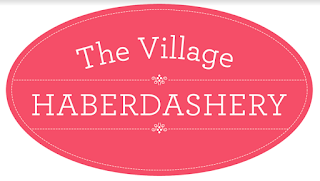 as well as trying to register for KAN (Knit August Nights) and making my Me Made May pledge had completely slipped my mind. It's actually the first of May here today and I'm in an Ivy pinafore and pair of Nixie Briefs as I type. I actually pretty much only wear Me Made garments these days, but I've realised that I've been reaching for the same combinations over the last few months (an Ivy paired with a Gable or Ostara top and a cardigan) and while it's such a comfortable outfit, I really need to start getting a little more inventive with my everyday handmade outfits. It's not like I have any lack of choice - this year is the first year that I'll have handmade underwear to add into the mix, so the only things I haven't made that I wear on a daily basis in my wardrobe are tights, socks, bras and shoes. And I'm pretty proud of that little fact. I do want to focus a little more on my knitting this month though (winter is looming...), completing another knitted garment is high on my list and should be very achievable - I have a cardigan for Oscar that is halfway finished, a nearly completed Wainthropp that is just awaiting some button band stabilisation (and buttons) and my Arboreal jumper is slowly taking shape (well, the fairisle is anyway...). 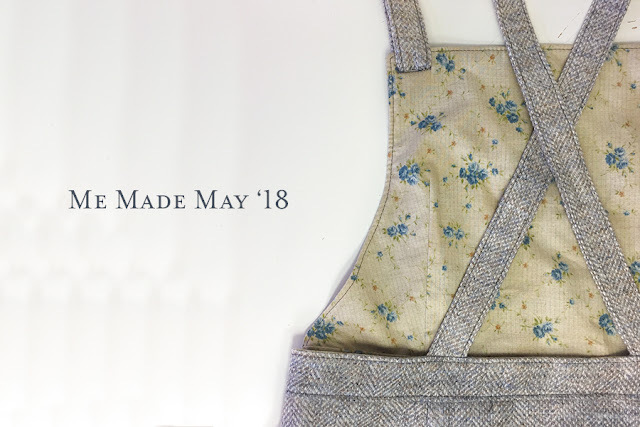 I, Jen of Jennifer Lauren Handmade and @jenniferlaurenhandmade on instagram, sign up as a participant of Me Made May '18. I will wear me made clothing everyday of the month and will get more creative with my daily handmade outfit combinations. I'll also finish at least one knitting WIP and will document my outfits as much as possible throughout the month. I will post the occasional round up on my blog and post updates on my instagram account. Are you signing up for Me Made May?